but the gardener does not. Now is the time to plan. 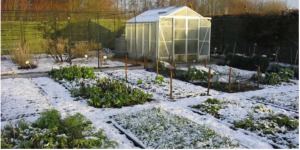 Use the quiet of winter to temper the craziness of spring planting. 2. Connect with members of the Garden Committee and set a date for a Spring planning meeting. Now that the second half of the school year is underway, people’s time will be filled once again with a plethora of activities. 3. Decide the direction of this year’s planting, i.e. themed gardens, curriculum ties, extra beds for a Garden to Cafeteria program, successive planting or a Youth Farmer’s Market in the fall. 4. SOIL TEST – your garden’s success can be heavily dependent on the state of the soil. CSU offers soil testing. Do it now before the lab gets busy and you have time to amend the soil if necessary. 5. Order any unusual or new varieties of seeds before they sell out. Seed To Table has a multitude of seeds of many varieties that are free to our Alliance members (stop by and pick some up now). We will be offering seedlings later in the spring as well. If you are looking for something unique, it might be prudent to order it early. Plus, seed catalogs are cool and offer a wealth of gardening and plant tidbits. 6. Check out our recommendations for seed companies.